It’s possible that I’m not a morning person. 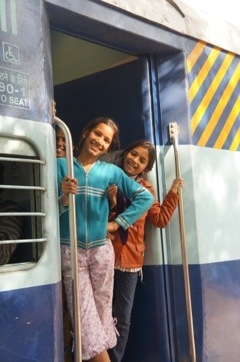 Overnight sleeper trains in India travel at their own sweet pace, which often may even bear some semblance to the timetable, though that cannot be guaranteed. This makes setting an alarm clock an exercise in guesswork. So far, my destination has been the final stop, so instead of an alarm clock I am alerted to arrival by the sudden rush for the exit (the train having stopped not being a reliable indication in itself). 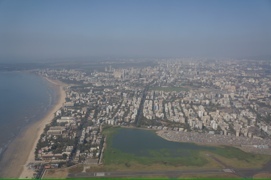 The effect of this method is that I arrive at my destination – in this case Bangalore – in a state of sleepy confusion. Shouldering my pack I make my way doggedly through the crowd, one step ahead of the porters who are visibly unimpressed that I should do their job for them and carry my own luggage. 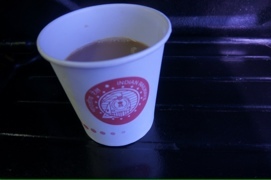 The plan is to find the taxi rank, but as I pass a cafe I am approached by a man finishing a coffee, who speaks excellent English (for future reference, if you are a tourist and approached by someone with excellent English, odds are they will be a tout, not a local). He shows me a printed card of taxi rates, and I figure one taxi is as good as the next and follow him to the car park where all the other taxis are parked. Only, his taxi looks more like a minivan, doesn’t have a meter, and has definitely seen better days. We rumble off down darkened streets, which seem to get narrower with each turn, and I begin to wonder if I’ve made a mistake. This is compounded when he tells me that the airport is 40km away, but googlemaps tells me it’s only ten. Again for future reference, it turns out that the tagging function on googlemaps is a pile of crap. Also, after long train trips sometimes your brain just doesn’t work. After a heated debate about where we are going and where the airport actually is, it dawns on me that the chances of the airport being in the inner city are minimal. Checking a completely different source (the airport website itself) it turns out that the taxi driver is right. He is also not a wily scheming kidnapper. 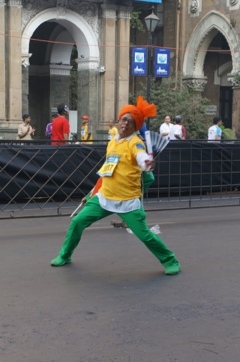 At most he has overcharged me about 200 rupees (£3), which he probably needs more than I do. After muttering the Indian equivalent of “I told you so”, he drops me right outside the correct gate at the terminal. Behind me, the sun is rising over Bangalore in a fiery ball of red. Perhaps next time I’m here I will have a chance to look around – it’s supposed to be worth a visit. For now I’m about to spend 7 hours in the airport (thanks Kingfisher! ), which ranks next to Brisbane airport for lack of facilities (though it does have phone recharging stations, 45 minutes of free wifi, and a small colony of sparrows in the canteen). I leave Goa in the dead of night – or close enough to, it is pitch black outside and even the stray dogs are asleep as I creep through the compound to the taxi. At the station it is hard to tell which way the train will arrive from. Indian trains are incredibly long, and my train is due to stop for only a few minutes, so standing on the right part of the platform is crucial. I spot a European couple in their early sixties and wander over to say hello; they are retired now but she worked for an insurance company in Bangalore for several years so they are old India hands. 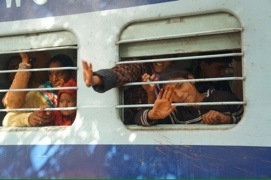 The trains usually follow the same pattern: an engine or two, the luggage car, the air conditioned sleeper classes (2AC and 3AC, rarely First) with tinted glass windows, followed by a string of general, 2nd class and non-air conditioned carriages with windows covered with bars but otherwise open to the elements. This couple are travelling in 2AC, so I stick with them until the train arrives – in theory my coach should be next to theirs. For the first six hours I have the compartment mostly to myself, then three couples pile in and stare at me curiously for a while (I’m getting used to this, and have stopped checking whether there is something in my teeth or down my front). The usual throng greets me at Hospet station, so it’s a relief to find my pre-booked taxi waiting for me. Hampi Bazaar is only 14km or so from Hospet, but I am staying in a small village across the river from the main part of Hampi, which requires a meandering drive around the long way, in part along the main road to Bangalore which is teeming with trucks. 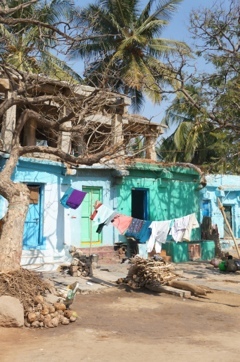 The construction of a new 4-lane highway is in progress, and the fronts of the houses lining the route have been demolished to make way (families continue to live, and shopkeepers to work, in these smaller dwellings, with makeshift fronts). The dust is inescapable. We pass whole families squeezed onto motorbikes – one small boy is peeking out from a balaclava (warding off the winter chill of 20+ degrees celsius), and I see more than one pair of earmuffs, which the driver assures me are for the cold, not the noise. 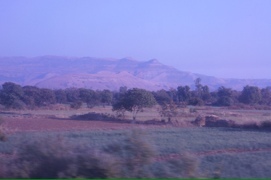 Eventually we turn off the highway, and make our way through a rural landscape of green rice paddies interspersed with huge sandstone boulders, over a wide blue river. The main entrance to the village is along a narrow, rutted dirt road which dips down to the river (and is, apparently, impassable during the monsoon, when the only access is by boat). 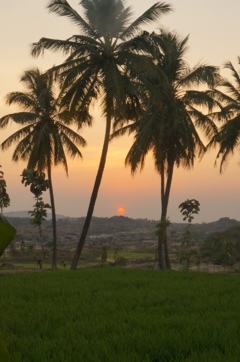 Shanti Hampi guesthouse is a series of small cottages set amongst the rice paddies at the very end of the village. Each cottage has a small verandah with a swing, and there is an open sided restaurant with low tables and cushions designed for lounging about and enjoying the view – glistening rice paddies, coconut palms and a path leading down to the river. It would be idyllic if it weren’t for the mosquitos, which are voracious. My room comes with a mosquito net, strung over a steel frame that looks as if it has been borrowed from a gazebo. Unfortunately this ingenuity doesn’t extend to the more fundamental requirements of a mosquito net: there are large holes and a gap of about a metre at one end where the net doesn’t stretch right across the bed. Finally I get to use the mosquito net that I have been lugging around, together with the little bag of pegs, clips and gaffer tape that I have tucked away in my pack for just such an occasion. Outside, white cranes are flying above the fields and, just after sunset, a cloud of bats swoop in and around the restaurant, feasting on insects. 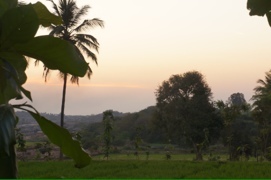 The rice paddies are lit by moonlight and I can even see a star or two. I fall asleep to the croaking of a frog chorus. The next morning, Alizé arrives from Hyderabad. We walk through the village and find the river crossing, where a small flat-bottomed motorboat ferries people, packs and motorbikes across the river to the ghats on the other side. This is the alternative route that I could have taken last night instead of the car, if I had arrived when the boat was still running. Climbing the steps to the road we are immediately surrounded by rickshaw drivers and hawkers selling sun hats and umbrellas embroidered with elephants and glass beads. Just around the corner we find the side entrance to the Virupaksha temple, the tall almost Mayan-looking structure that is visible from across the river. This is a working temple, so we must remove our shoes before entering the complex. By the time we return our feet will be filthy. Inside, the complex is buzzing with pilgrims and tourists. Seeking some shade and a quiet corner we follow two young girls up some steps where a blackened statue of a goddess is locked in a cage in a darkened corner. The girls kneel and I notice that they are carrying coconuts and garlands of marigolds. They lay the marigolds on the ground in front of the statue before smashing the coconuts open on the stone floor and letting the milk inside fall onto the ground. 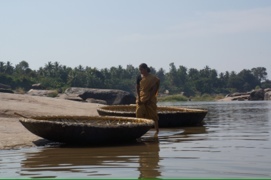 After a few moments of prayer, they collect the coconuts again and depart, smiling shyly at us. Below, a queue is forming to enter the inner sanctum, watched over by macaque monkeys with an eagle eye for any fallen coconuts or other treats. 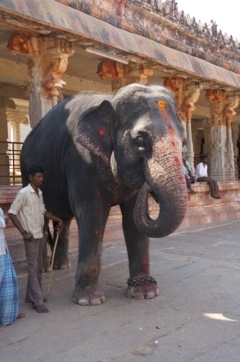 In the main courtyard stands the temple elephant, Lakshmi (named for the goddess of wealth). He (the tusks are a giveaway – only the male Indian elephant has them) has learned a clever money-making trick. If you hold out a coin (or a note, if you are not Indian), the elephant will take it from you with his trunk, and lay his trunk on your head for a moment to give you a blessing. It is the first time I have seen an elephant here, so I step forward and take my turn, just to touch his trunk. It can’t be much of a life for an elephant. At least this Lakshmi is taken to the river every morning to bathe, but there are long hours standing on hard stone in between. There are elaborate carvings and paintings throughout the temple complex, and to learn more about them we decide to hire a guide. We are a little late in the morning, and the guides are all busy, but one young guy says he will check with his current clients to see if we can join them, and a few minutes later we are walking back through the temple to see paintings of the three main Hindu gods, Brahma, Vishnu and Shiva, on the ceiling of the temple. Our companions are two Chinese guys, one in his thirties and the other in his sixties. The younger man has a large SLR camera and an even larger tripod, and is intent on taking timed pictures of himself in front of each monument. I get the impression that our guide is happy to have additional clients who are more interested in finding out about the site. Our guide, Mr Rajkumar, studied archaeology at university, and is also a devout Hindu, keen to tell us the stories behind the carvings as well as the history of the sites. He takes us into the inner sanctum of the Shiva temple, where we had seen crowds queuing earlier, and we are whisked past the main deity in a cloud of incense, emerging with white tilak marks (white being Shiva’s colour) on our foreheads. In the same complex is a Vishnu temple, and in this we are given a red tilak (Vishnu’s colour), before we collect our shoes and wander along the long avenue in front of the temple, to our next destination. This avenue is Hampi bazaar (and gives its name to the tourist township between the temple and the river). Historically a market place, it is now lined with brightly painted shops made of concrete block, selling hats, sunglasses, snacks and tourist tat. The IAS (Indian Archaeological Survey) is unhappy with the calibre of the market in its current incarnation. Their solution: to demolish the shop fronts of each building, in an effort to encourage the occupants to relocate. The occupants (like their counterparts on the highway) are having none of this, and continue to live and trade in their foreshortened homes. We make our way along the street and down stone steps to the boulders at the edge of the river, where flat round coracles are waiting. Boarding is an exercise in careful balance, and then the young boy pushes off from the edge with his pole and we drift into the current, swirling and eddying down the river. It’s the most peaceful experience, leaving the heat and the clamour behind. 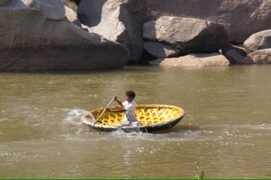 There are just a few other coracles on the river – young boys practicing their trade, who begin a noisy waterfight with each other when they see us watching them. Before long our guide gives a signal, and we pull into the riverbank, clambering over boulders to see small shrines and carvings stranded on islands in the middle of the river. There is a carved Nandi, or bull, keeping watch across the river, a sign that a Shiva temple is nearby. Sure enough, we climb some worn stone steps to find a grid of 500 small Shiva linga and a small temple on the hill that looks almost Greek. We float further downriver, and I am sorry when the little boat finally stops and the ride is over. 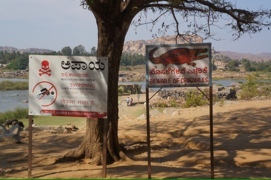 We appear to have emerged in the middle of nowhere, next to a sign saying “beware of crocodiles”, but either it’s there for scare value or it’s too hot even for crocodiles as there are none to be seen. 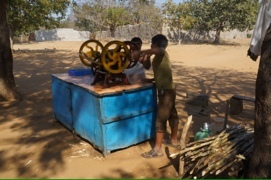 Nearby a father and son team are crushing sugar cane and straining the juice into glasses for parched passersby. I’ve seen the water they wash the glasses in, so I’m not going near it, but our companions have less qualms. We have landed near to the King’s Balance, or what’s left of it – in days of old, the king would sit on a scale here, and his weight in gold and jewels would be measured out and distributed to the locals. Nearby there was a gold market, and in the temple beyond a thriving horse market. 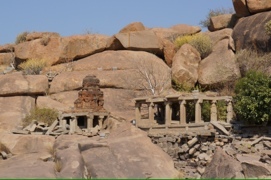 Hampi was once a vast city, built by the Vijayanagar dynasty, until the Mughals came from the North looking for treasure, leaving a ruined city in their wake. These days, it’s mostly ruins and dust, but the ruins are pretty impressive. Suddenly we realise that the sun is low in the sky – enough sightseeing for one day, if we don’t make the last river crossing at 6pm we’ll be stranded (or, more likely, required to pay the late crossing fee, equivalent to the cost of a full boat and, having seen just how many people they cram onto the ferry, it wouldn’t be cheap). The next morning at 9am we cross the river again and meet our guide, Rajkumar, and the two Chinese guys (whose names we never actually learn). Yesterday we saw the sights within walking distance of the market. 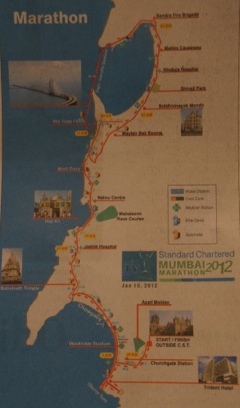 Today we will see the rest of the city, spread over some 20km or so, by auto-rickshaw. But just as we are about to set off to meet the rickshaw drivers (who are, of course, friends of our guide), a tall orange float appears, surrounded by men and boys with drums and cymbals. 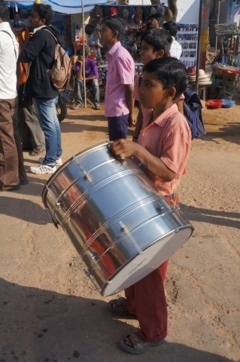 It turns out that our guide is also a musician, and he is conscripted by the marchers and handed a drum. We stand on the side of the road and watch him disappear into the distance. Meanwhile the young Chinese fellow is still fixing his tripod. After a few minutes our guide breaks off from the procession and comes back to join us, a huge grin on his face. 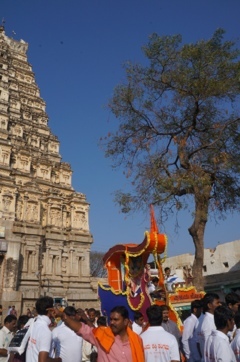 The rickshaws arrive and we pile in, heading for our first stop – a huge statue of Narasimha (Shiva as angry lion-man). Our Chinese companion is setting up his tripod again when an old woman rushes over and gestures angrily. No tripods without a permit! So we all pile into the rickshaws again and head for the ASI office. Our Chinese friends disappear inside with the guide, and we wait by the gate. And wait. And wait. Eventually they emerge, the person with the right stamp is not there (our rickshaw driver says more likely they haven’t paid enough money – the unofficial fee, one assumes). The permit will later be delivered to our guide by a passing rickshaw, but for now: no tripod! We are finally on our way again, but before too long we are waved down by a security guard. Our rickshaw joins the queue of traffic parked on the roadside and we continue by foot, but at the next bend we are stopped once more: up ahead tv cameras glitter in the sun, and a tv commercial is being filmed. A truck bearing the logo of the product, Good Time biscuits, is parked strategically near an ancient arch, and two small children in school uniform are feigning excitement about a packet of biscuits that is positioned to look like it’s fallen from the van. After a couple of takes our guide decides we have waited long enough, so we walk past the cameras (he points out the readilawn that has been laid on each side to make the road look more appealing for TV). The rickshaws will follow later. At the entrance to the next temple we are loaded onto golf carts and ferried down a long sandy path lined with ancient stone columns. 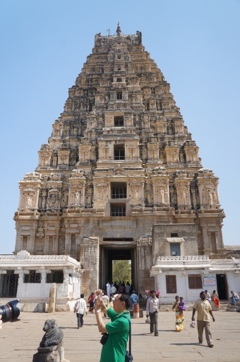 This is Vitala temple, one of the most famous spots at Hampi. There was once a huge market here, with traders arriving from China and Mongolia to haggle for horses, jewels and gold. 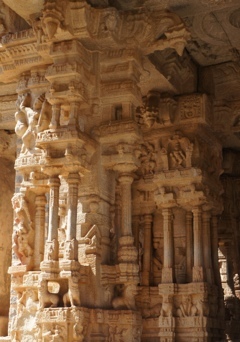 In the courtyard of the temple complex stands a vast stone chariot containing a statue of Garuda (the eagle, and Preferred transport for the god Vishnu, for whom Vittala is another name). Nearby is a pavilion with columns surrounded by a series of smaller pillars. This was the Queen’s dancing hall, the outer pillars draped with screens to shield her from view as she danced, and the pillars themselves provided the musical accompaniment. Until three years ago, it was possible to enter the pavilion and try to play them, and our guide has done so, but too many amateur percussionists has led to damage, and the steps are now guarded by stern security guards. 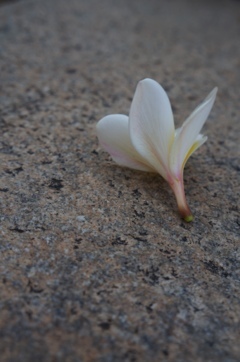 Beside the pavilion is a large leafless tree, each branch tipped with white frangipani flowers. The fragrance is heavenly, but we can’t stay – the day is getting hotter and our guide isn’t finished with us yet. Instead we’re back on the golf carts, into the rickshaws, zooming past the tv commercial and on to the Queens Bath. 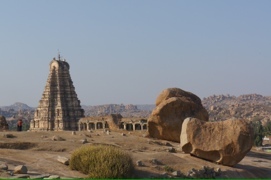 According to our guide, the king who built much of Hampi, Krishna Devaraya, conquered 7 kingdoms during his reign. 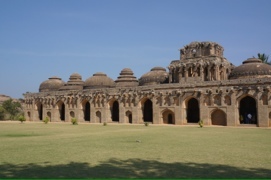 From time to time each of the kings of those kingdoms was summoned to Hampi. They were accompanied by their queens, who complained of the heat, and the baths were built for their sole enjoyment. 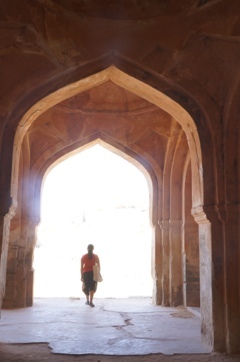 The buildings combine Hindu, Jain and Muslim architecture, and the Islamic-style archways are probably the reason the building was not destroyed by the Mughal invaders (that, and there is only so much you can do to ransack a swimming pool…). Sadly the baths are now dry, so we move on. It is searingly hot now, and we’re getting hungry, so we pull over at a tiny roadside stall for lunch. It’s hardly even a shack, and a few rickshaw drivers are perched on a nearby wall with their meals and cups of chai. 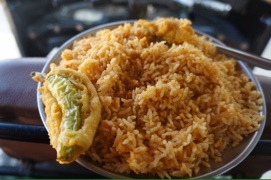 Our guide tells us to wait in the rickshaw, and returns a few minutes later with a plateful of piping hot fried rice, on which are perched two large green chillies in batter, stuffed with a peanut paste. Mirchi pakoda, apparently, with masala rice. 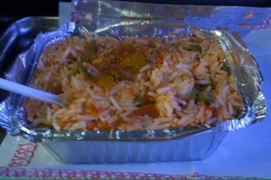 A little greasy but just what we needed, and at only 30 rupees maybe the cheapest meal I’ll have in India. Duly refreshed, we wander a little further down the dirt track to a high stone wall. 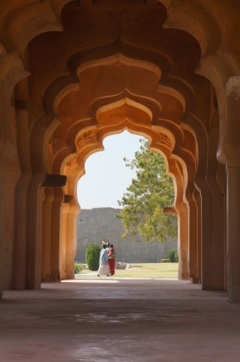 Beyond the wall lies the Zenana compound, where once the Vijayanagara queens spent their days. The palace has been reduced to its foundations, a platform in front of a dry boating pond, and the watchtowers in each corner are crumbling, but on the far side of the complex stands an elaborate pink stone pavilion – the lotus temple. 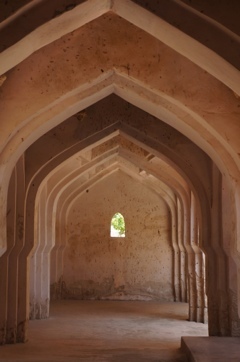 It is open on all sides, a series of arches and passages, the inner parts of which are hollow. When the summer heat was at its peak, a water tank in the roof would be filled from a nearby well, and the water would overflow into pipes laced throughout the structure. The queen and her attendants would retire to this pavilion to enjoy the 15th century equivalent of air conditioning. Through a gate in the corner of the compound lie the elephant stables, where the king kept his considerable fleet of four legged vehicles. The only sign of its former inhabitants these days are the stone replicas in front of the adjacent museum, which is filled with statues of various deities who have had the misfortune to suffer a chip or other damage (statues with even minor damage are no longer worshipped, on the basis that, if they cannot protect themselves from harm, there is little hope that they will be able to provide protection to their worshippers either). From the palace of the queen, we move to the ruins of the main royal palace. In a corner of the ruins we see the remains of an elephant landing stage, where royalty would descend from their howdahs. 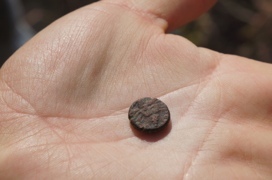 Our guide is beyond excited to find a tiny vijayanagara coin amid the stones. 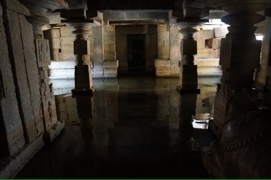 Nearby there is another Shiva temple buried underground, and surrounded by a moat. The inner sanctum is half submerged, but stepping stones reach just far enough to let us see a little way into the gloom. The cool of the underground is welcome – by now I am just about templed out – but our guide insists there are just two more sites that we need to see. Around the corner and up a hill lies a huge statue of Ganesh. From the front you can see the elephant god (son of Shiva, in case you were wondering), but from behind it appears as if there is a woman’s back, as if Ganesh’s mother Parvati is holding him on her lap. One last Ganesh temple, this time with sweeping views of the bazaar, then we are racing in our rickshaws down the steep hill and back to the bazaar, and racing again for the last boat across the river. 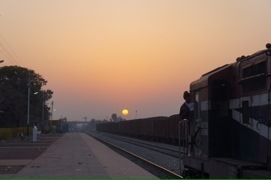 There is just enough time to have a last dinner with Alizé (who is about to embark on an 8 hour overnight bus trip to Goa) and to see one last Hampi sunset, before making my way by taxi along the darkened road to Hospet to board the overnight train to Bangalore. 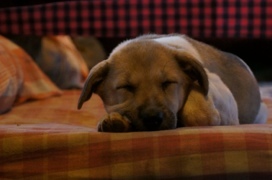 Gratuitous puppy shot (a stray that had found a home at our guesthouse). At the station I find a safe spot away from the crowds next to an elderly woman, who gestures for me to sit next to her. 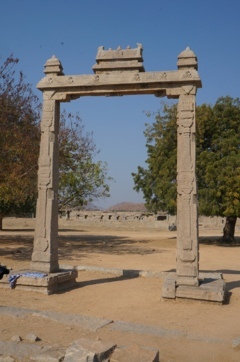 Sumathi has been in Hampi on a pilgrimage – her family are grown, her husband retired, and these days she travels “where the goddess sends me”. We are in the same carriage, and she translates the tannoy announcements for me (the train is delayed, naturally), but I lose sight of her on boarding, and concentrate on heaving my backpack through the carriage to find my berth, before settling in for the long trip.